Well this is a first for me and this blog, Darknet has been nominated for a blogging award and selected as a finalist! There’s some heavy-weights in our category too like SANS ISC and Evil Bytes from Dark Reading. If you don’t know about SBN (Security Bloggers Network) it’s a VERY good collection of RSS feeds in the security arena, blogs rather than news sites hence the name. If you’re interested do check out the members (you’ve probably already subscribed to quite a few) and some of the stronger ones are amongst the nominations below. 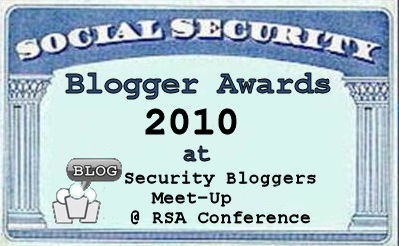 Obviously being in the same category as SANS ISC I won’t be wasting any time writing an acceptance speech. It is an honor to be in the same list as blogs like Bruce Schneier’s and Tao Security even if it’s in a different category. Good luck to everyone and may the best blog win. nice 1 mate, well deserved this is a quality blog. This site Author(s) deserve this award for the commitment and all the hard work the team has put in. I wish you all Congrats!!! on this Occasion. Keep up the “Great Work”. Good luck mate, this is a pretty good blog one of the few that stays in my RSS reader on 0. Even giving some linkage to your competition is good as it gives me others to look at. Although SANS ISC seems like a definite winner with over 300,000 unique clicks per day. But your commitment will get you there soon! Thanks guys, appreciate the kind words and support. PrinceTtang haha yah the answers to my most asked question..